Why not join me and get a jump start on your Christmas cards? If we begin now, they might be done by Christmas and we wouldn’t be stressed. This weeks challenge at Late Night Stampers is a Christmas in July card. My current Christmas paper has not arrived so I used Pink Flamingo designer paper and the nontradional color of Cameo Coral. I really like how the card turned out. Hope you like it too! 1. Begin by folding 5 1/2″ x 8 1/2″ Old Olive in half. Layer 4″ x 5 1/4″ Cameo Coral and 3 7/8″ x 5 1/8″ Pink Flamingo DP. Pierce corners and mount to card base with dimensionals. 2. Die cut one Shimmery White and Real Red Top Note die. Trim white edge of Shimmery White top note. Attach 1 1/4″ x 4 3/8″ Pink Flamingo DP to the bottom of Shimmery White and trim. Attach 3/16″ x 4 3/8″ Real Red strip at seam and trim. Attach to Real Red Top Note. 3. Stamp “Happy Holidays” in Basic Black and watercolor in Old Olive, Real Red, Crushed Curry, Soft Suede. Color text using Versamark pen, cover with clear embossing powder, and heat. Wrap top note die in Old Olive ribbon and tie bow. Attach finished piece to card base centered. Today’s share is the card and pencil box directions. We’ll begin with the card. 1. Fold 4 1/4″ x 11″ Pretty in Pink cardstock in half. 2. Cut two pieces of contrasting Razzleberry Lemonade designer paper 4 1/4″ x 2 1/2″ and 4 1/4″ x 1″. 3. Cut 6 Pretty in Pink and 5 Melon Mambo word window punches. Attach them to the backside of 4 1/4″ x 2 1/2″ designer paper 7/8″ from the top edge. Attach (2) 3/16″ x 4 1/4″ pieces of scrap cardstock to backside of word window punches. The first is at the top edge of designer paper and the other 1/4″ from the end. Score across backside of word window punches at 11/16″ and 15/16″. Fold to make awning. 3. Cut 4 1/4″ x 1″ Rich Razzleberry cardstock and scallop 4 1/4″ side. 4. Attach 4 1/4″ x 2 1/2″ designer paper to backside of top edge of scalloped piece. Attach 4 1/4″ x 1″ designer paper to backside of bottom edge of scalloped piece. Wrap Melon Mambo ribbon at top edge of scalloped piece and tie knot. Attach finished piece to card base 1 1/4″ from the bottom. 5. Stamp platter in Pretty in Pink and sentiment in Melon Mambo on 2″ x 3 3/4″ piece of Shimmery White cardstock. Color cupcake stamp using Pretty in Pink and Rich Razzleberry markers. Stamp on Shimmery White scrap. Trim leaving white with paper snips. Attach above sentiment with dimensional. Color cherry stamp with Chocolate Chip and Melon Mambo marker. Stamp on Shimmery White scrap and trim with paper snips. Attach to the top of cupcake. 6. Layer Shimmery White cardstock to 2 1/8″ x 3 7/8″ piece of Rich Razzleberry cardstock. Attach finished piece to card base 3/8″ from the left side and 1/2″ from the bottom. The pencil box can be used for so many purposes. With school about to start, this would make a great gift. The pattern can be printed directly to the backside of your cardstock, cut and assembled. Cut the black lines and score the red ones. The directions for assembling are printed directly on the pattern. If you have any questions just ask. I am happy to help you. 1. Before assembling the top, cut 3/4″ x 3 1/4″ Rich Razzleberry cardstock. Scallop 3 1/4″ side. Attach to backside of top’s bottom edge. 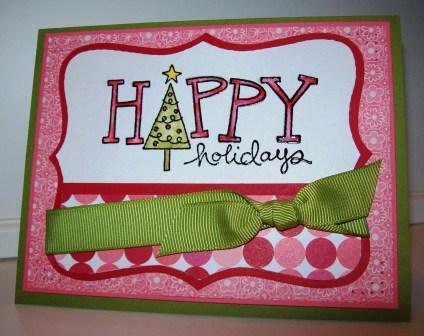 Cut 1/2″ x 3 1/4″ of Razzleberry Lemonade designer paper and attach to frontside of top’s bottom edge. Score top and assemble. 2. Assemble box bottom, and cut (2) 1/2″ x 1 3/16″ pieces of Razzleberry Lemonade designer paper. Stamp sentiment in Rich Razzleberry on 1 3/6″ x 1 1/2″ Shimmery White cardstock. Attach designer paper, Shimmery White cardstock, and designer paper on box bottom beginning 1/2″ from the top. 3. Wrap box with Melon Mambo ribbon at the bottom edge of designer paper. Color stamp with Pretty in Pink and Rich Razzleberry marker and stamp scrap of Shimmery White cardstock. Cover with Tombow adhesive and sprinkle with Dazzling Diamonds. Punch hole in top left corner with piercing tool. Thread hole with Linen thread and tie to Melon Mambo bow. Fill box with 4 pencils of your choice. Hope you find the instructions helpful. The three items would make a great party planning class. Check back often or consider following my blog for more helpful ideas. Hope you have a great day and happy stamping! I’m glad everyone enjoyed the Blog Tour. I hope you were able to secure several ideas for upcoming workshops and classes. The links are gone, but you can access each participating blog through the Tour Home page links. Congratulations! The winner of the July kit is post number 17 – Kathy White! Look for your kit to be emailed today. Not a winner, no need to be sad, the kit can be yours. Access the link here. 1. Cut 3/4″ x 12″ piece of Razzleberry Lemonade designer paper. Score each end at 3/4″. Apply snail adhesive and place scored line on corner and wrap holder. Cut 3/4″ x 3 1/2″ piece of Razzleberry Lemonade designer paper and attach to fourth side of holder overlapping scored ends. 2. Cut 5/8″ x 11″ strip of Rich Razzleberry. Scallop 11″ side. Attach to top edge of Razzleberry Lemonade designer paper. Cut 5/8″ x 3 1/2″ strip of Rich Razzleberry. Scallop 3 1/2″ side and attach to fourth side of holder. 3. Punch 1 3/8″ Crushed Curry Circle. Attach to right side of holder with dimensionals. 4. Color cupcake stamp with Rich Razzleberry and Melon Mambo markers. Stamp onto Shimmery White cardstock. Trim leaving white border with paper snips. Apply 2 way glue to Melon Mambo icing and sprinkle with dazzling diamonds. Attach to left side of Crushed Curry circle with dimensionals. 5. Color candle stamp with Rich Razzleberry and Crushed Curry. Stamp onto Shimmery White cardstock. Repeat twice. Trim each candle leaving white border with paper snips. Attach to icing with small glue dot. Apply Crystal Effects to flame. 6. Tie knot in Melon Mambo ribbon and trim ends. Apply to bottom right corner of cupcake with glue dot. The cupcake pick was created by scalloping a 1 7/16″ x 1 9/16″ piece of Rich Razzleberry cardstock. Begin with full scallop at each end of the 1 9/16″ side. There should be 3 scallops on each side and 4 scallops across the top and bottom. Stamp sentiment on Shimmery White with Melon Mambo and Rich Razzleberry. Cut out Melon Mambo stamped piece at 1″ x 1 5/16″, rounding corners. Cut out the word “you” from the Rich Razzleberry stamped piece and attach over Melon Mambo using dimensional. Color cherry stamp with Chocolate Chip and Melon Mambo markers. Stamp onto Shimmery White cardstock. Trim with paper snips and apply to right side of sentiment. Attach large glue dot to backside of finished piece. Place tip of toothpick into glue dot, and attach scalloped Rich Razzleberry centered to back. Wrap Melon Mambo ribbon around toothpick and tie in knot. Trim ends. Apply Crystal Effects to the cherry. Stay tuned, tomorrows post will include the card and pencil box. Hope you have a wonderful day! Hope you are ready to celebrate! My projects today are for a girl’s birthday party. It’s not really a party without a little cake and ice cream. How about your own cupcake served up in style? There’s just something about packaging that just “takes the cake”! My second project was found window shopping on a warm sunny afternoon stroll. There is nothing like the shade of a little striped awning to beat the heat. The cupcake came straight from the little bakery shop window. A coordinating birthday card is a girl’s delight complete with a “cherry on top”. To complete the birthday ensemble the final project is a pencil box favor. What a nice way to say thank you to each party guest! This one will come in handy when school’s back in session. Hope you enjoyed the stop and have been inspired to create something fun today! Please consider registering to follow my blog. As always, reading your comments is the highlight of my day! Don’t forget to enter the drawing by posting your comment. By the way, stop back after the tour! You could be the lucky winner of my July class planner. I’ll also be posting measurements and directions for each project to any interested viewers. Enjoy the ride and happy stamping! Friendship is priceless. Some of life’s richest blessings lie in our relationships with each other. Today I’m experiencing an overwhelming sense of thankfulness for all of my friendships. This share is in worship to my greatest friend, Christ! Instructions and details were created and available FREE here. It is a case of this beautiful card created by Beate. Hope it blesses you today! Simple elegant describes this one today. It was a card that took me 15 minutes to create. It doesn’t get much better. This one would make a great workshop card and give you another reason to buy the Big Shot. That handy tool makes creating so easy and fun! My inspiration was found spending time with my friend, Katya from Belarus working on her wedding album. We used this down the side of several pages yesterday. The blog tour is in just a couple of days. There will be so many great projects and ideas floating around. I’ve got my sketch book ready and can hardly wait! How about you? 1. Fold 5 1/2″ x 8 1/2″ Shimmery White cardstock in half. 2. Cut 2″ x 6″ strip of Basic Black and Pretty in Pink. Apply adhesive to back of pink, layer, and run through the Big Shot. 3. Remove the black and pink from the right side. Remove the pink from the left side. 4. Trim the cardstock flush with the card base. Wrap the left side with Pretty in Pink ribbon and tie. 5. Stamp sentiment in right corner using Versamark, sprinkle with Black embossing powder, and heat. 6. Apply layered piece to the left side of card flush on the top, bottom, and left side. 7. Congratulations you are finished! At the Stampin’ Sistas club meeting this month we made a little designer notebook that will slip right into your purse. You will always have paper and a pen handy with this one. I’m sharing the photo with you today. If you are interested in directions please leave me a comment with your email address and I will be happy to forward to you. Sharing with friends is so much fun. Speaking of sharing, the blog tour is less than a week away. I’m featuring the stamp set “On A Pedestal”. There are some great sample shares coming so stay tuned. My July kit is finished, and I will be posting it this week. Register to follow my blog during the tour and you may take home the July kit free!